Samsung Galaxy S series is one of the most important Samsung's smartphone lines, and the S series always bring us surprise with the great performance. No matter its features, specs, design, and of course the price, are the highest among Android devices. There are massive Galaxy S series fans all over the world as well. And we all know that lately Samsung released the newest high-end Android flagship of S series, yes, the Samsung Galaxy S8 and S8 Plus, which aims to rebuild Samsung's reputation after Samsung Galaxy Note 7's explosion scandal. If you can't wait to upgrade to the new Samsung Galaxy S8 or S8 Plus phone from your old Samsung Galaxy S7, S6, or S5, make sure all your important private data come with you. Of course, Samsung provides its own data transfer methods to switch your old phone to Samsung Galaxy S8, the Samsung Smart Switch. However, Smart Switch is not that perfect. And this article is here to give you another great alternative to help you transfer your old Samsung Galaxy S5/S6/S7 data to the new Samsung Galaxy S8. Syncios Samsung Data Transfer may be the best option for Samsung users to transfer data between Samsung devices. This great handy tool allows you to transfer contacts, text messages, videos, music, photos, etc from iOS to Android, Android to Android, iOS to Android, iOS to iOS, and it supports restoring data from iCloud and iTunes backup. Worth a try. Check the steps below. 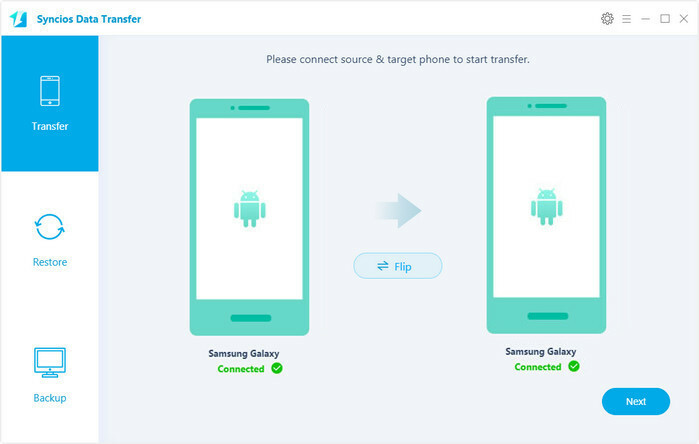 Connect both your old Samsung device and new Galaxy S8 to computer and launch this Samsung Galaxy Transfer tool. Scroll down the phone screen and get both of your phones USB debugging mode enabled. You can also connect both of your phones via WiFi networks. 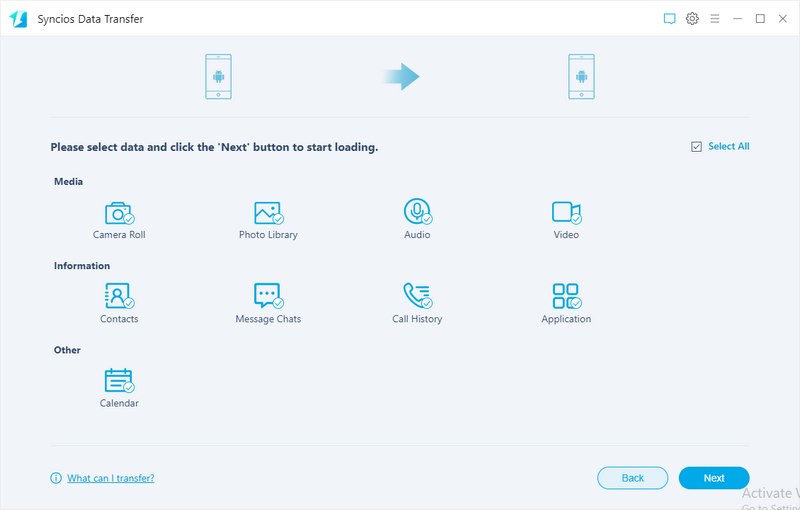 To transfer your data from old Samsung device to the new Samsung Galaxy S8/S8 Plus, simply click Next button under Phone to Phone Transfer module. After connected both phones successfully, Syncios Samsung Data Transfer would load all your data on devices automatically, simply check your desired items on the middle panel after that to sync, remember to make sure your old phone listed on the left while the Samsung S8 on the right, you can change the position by clicking Flip. Then click on Next button to start the transfer process. After a while, all your desired data would be synced from old Samsung Galaxy phone to Samsung Galaxy S8/S8 plus successfully, click OK to end it.